This article follows on from my piece in last November’s issue which covered the general description and introduction of the Class 395 units that will operate on Southeastern. These are being commissioned by Hitachi engineers at the new purpose-built depot at Ashford. Depot Engineer Neville Dyson extended an invitation for a more detailed look at the technical aspects of the Class 395 at the Ashford depot – in particular the progress of the commissioning timetable and meeting some of the staff assigned with these processes. Jason Andrews who is the Technical Trainer based at Ashford explained that engineering, maintenance and procurement are all located in the same office. This is to promote a constant free-flowing stream of information between depot engineering and maintenance and to allow prompt communication whilst dealing with any delays in service. For movements within the confines of the depot, the Train Movements Team Leaders (Shunters) are in charge of depot movements and seeing units out into traffic. They are based in the ’shunters cabin’ outside in the yard. However, there is a constant video and audio feed between them and the Fleet Delivery Manager in the Operations Room. On entering the maintenance area, a Zonegreen SMART Depot Protection Personnel System is fitted to protect staff who carry out maintenance and repairs on the units. This is operative on all five roads. When staff are working on a particular road, this system allows them to sign into the road, thereby locking that road off to any train movements. The staff have to sign out of the road before train movement is permitted. The first three units delivered for testing purposes were all at the depot during my visit, one positioned on the road that houses the BBM bogie drop equipment. As with most modern depots now being built, a bogie drop is fitted to allow easy removal and exchange of vehicle bogies to reduce downtime for vehicles at depots. A bogie can be lowered into a pit below the road and transported to the stores area. A new bogie is then replaced and fitted. Thanks to the bogie drop, this operation takes a minimum amount of time and effort. A separate Sculfort wheel lathe is housed in a purpose-built shed away from the main depot. The 395 new wheel dimension is 870mm and the last turning size is 800mm. The wheel lathe is already in operation carrying out work for other Train Operating Companies. All new-build trains and vehicles are now fitted with a Train Management System that is basically an on-board computer that monitors and records how the train is performing when in operation. At maintenance periodicities this information is then downloaded by technical staff using laptops and stored in the vehicles’ history information system at the depot. The recorded data is then used to monitor the reliability of the equipment fitted, to look for any out-of-course occurrences that may have happened during in-service operations and to keep a check on maintenance requirements. The Train Management System is provided so that drivers and maintenance staff have information on train performance, faults (with actions to mitigate them), tests (prove system operations) and commands (i.e. selective door control). The system is configured with Central units in the DPTS vehicles and terminal units in the MS vehicles and is interlinked by a transmission trunk line. TMS login screen takes approximately 40 seconds from start up to function. (This is the ’Boot Up’ time for the whole unit i.e. starting the unit from cold, to being ready to drive away). Also fitted is a memory facility to record any abnormal functions of equipment. It is important to consider that the Class 395 units will achieve a high-speed operation of 225 km/h and will have a relatively short station dwell time. (minimum 30 seconds, maximum 90 seconds) The side entrance doors are specified to be 1100mm width with an airtight function. 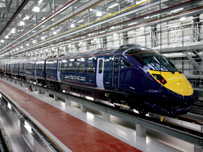 External door system reliability is of the utmost importance to operational service trains. Attention to reliability and quality of door system is achieved by using pneumatic sliding doors that retract into carbody door pockets. The construction of a pneumatic sliding door is very simple, when compared with a sliding plug door. The pneumatic sliding doors slide on the door rail by only pressurised air. This creates a simple linear motion and reduces the number of components required to operate the doors, especially when compared to sliding plug doors and therefore reduces the number of possible fault scenarios. When the unit is in motion, the external door system provides an air tight seal to the carbody. The air tight seal is achieved by pressing the external door against the carbody at four positions by a simple actuator and linkage mechanism. The Hitachi Class 395 is a 6-car, fixed formation, dual voltage, EMU designed to operate domestic services over both CTRL and Network Rail lines. As part of the process to demonstrate that the Class 395 Unit is suitable for operation over Network Rail DC lines and CTRL it is necessary to ensure that the tare brake performance with the unit operating up to maximum speed is acceptable and compliant with the relevant standards. Testing was carried out on Network Rail lines within an SPZ between Margate and Whitstable up to 100 mile/h (160 km/h) and on CTRL up to 140 mile/h (225 km/h). Testing was carried out as specified in the test procedure on Class 395 Unit 001, which was in the tare condition with fully inflated secondary air suspension throughout the tests. My thanks to both Jason Andrews for his time and technical knowledge throughout my visit and to Neville Dyson for his invitation to visit the depot.